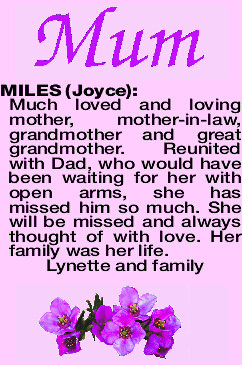 MILES JOYCE Much loved and loving mother, mother-in-law, grandmother and great grandmother. Reunited with Dad, who would have been waiting for her with open arms, she has missed him so much. She will be missed and always thought of with love. Her family was her life. 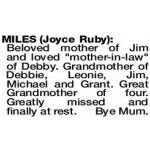 The Funeral Cortege for Mrs Joyce Miles of Gosnells will arrive at FREMANTLE Cemetery, Carrington St, Palmyra at 3.00pm on TUESDAY (26.03.2019) for a Cremation Service. Please assemble at the Carrington Pavilion at 2:45pm. Beloved mother of Jim and loved "mother-in-law" of Debby. 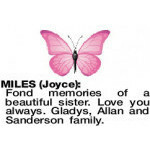 Grandmother of Debbie, Leonie, Jim, Michael and Grant. Great Grandmother of four. Greatly missed and finally at rest. Bye Mum. 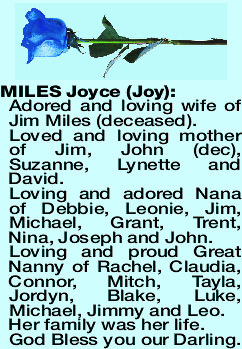 Adored and loving wife of Jim Miles (deceased). 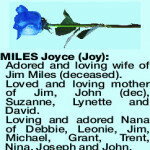 Loved and loving mother of Jim, John (dec), Suzanne, Lynette and David. Loving and adored Nana of Debbie, Leonie, Jim, Michael, Grant, Trent, Nina, Joseph and John. Loving and proud Great Nanny of Rachel, Claudia, Connor, Mitch, Tayla, Jordyn, Blake, Luke, Michael, Jimmy and Leo. Her family was her life. God Bless you our Darling. Loved mother of Suzanne and Mother-in-law and dear friend of Eddie, loving Nana to Nina and Greg, loving "NannyPop" to Blake and Luke. You were strong and courageous to the very end. I am both broken hearted that you are gone but so happy you are with our darling Dad again. How he must have missed you. I will never forget these last 3 months and how you struggled to stay with us. It was a privilege and an honour to be with you and my brothers as you passed from this life to the next. Mum and Dad fly high, I love you both dearly. Fond memories of a beautiful sister. Love you always. Gladys, Allan and Sanderson family. 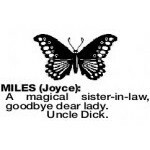 A magical sister-in-law, goodbye dear lady. 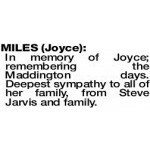 MILES JOYCE In memory of Joyce; remembering the Maddington days. 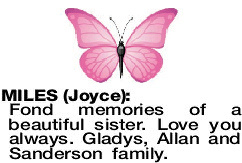 Deepest sympathy to all of her family, from Steve Jarvis and family.